Top: Sulfide ore processing. Bottom: Oxide ore processing. The process varies slightly depending on the type of ore that is being mined. Sulfide ores are first put through a jaw or gyratory crusher to reduce the rocks to about 7 - 8 inches. This material is then fed to a secondary grinder that further reduces the size to about 1 - 2 inches. 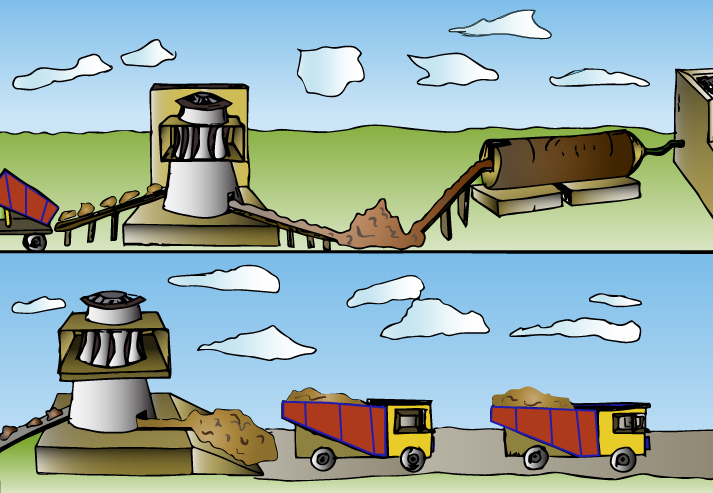 The next step is to feed the crushed ore into a wet grinding process in tumbling mills. These mills contain the ore, water and steel balls and further reduce the particles to the optimum size for the flotation process which follows. About 80% of copper from ore is generated using flotation, smelting and refining. Oxide ores are generally just crushed prior to further processing since leaching does not require the same small particle size as floatation.